. 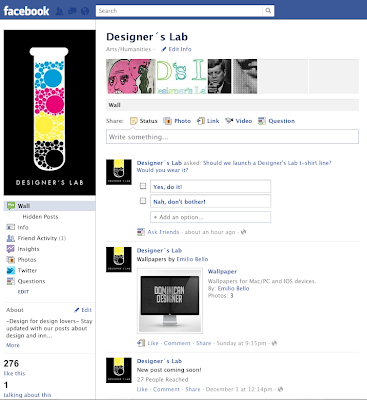 ::Designer's Lab::. : T-shirt Or Not T-shirt... Help Us To Decide. T-shirt Or Not T-shirt... Help Us To Decide. We've been thinking on create a t-shirt line for Designer's Lab. You can help us decide if we should or shuldn't do it, by participating on the poll at our Facebook page. We'll appreciate our readers opinion. Initially we created Designer's Lab to share design projects and experiments that we were working on, along with our process and what we learned from it. Hence the name "Designer's lab" but we got too busy with school, so for now we share inspiring design we come across. — Enjoy. The Art of Lora Zombie.